The morning after Palenque was pretty much straight driving, about ten solid hours of decent highway and flat lands with dense vegetation. Just the night before, RG and I had decided to add an extra passenger, Manuel, an Iberian masseur with the excitement of a fifteen-year-old and the grand politeness of a Spanish hidalgo. 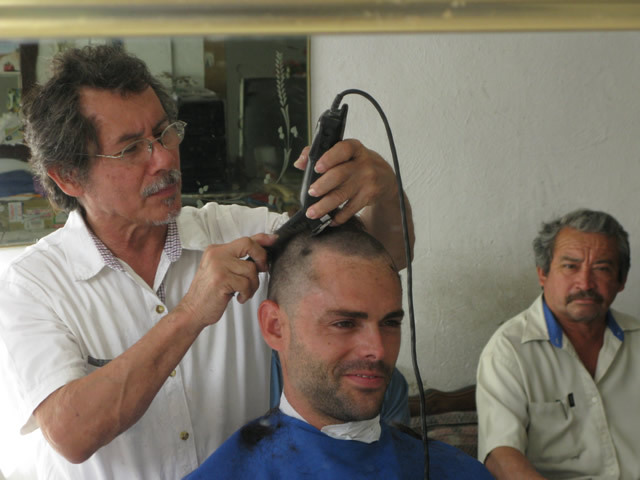 I had seen him for a short time at the Oaxaca Children Center, but our encounters in San Cristobal had proven that he was good people, and a lot of fun to be around. 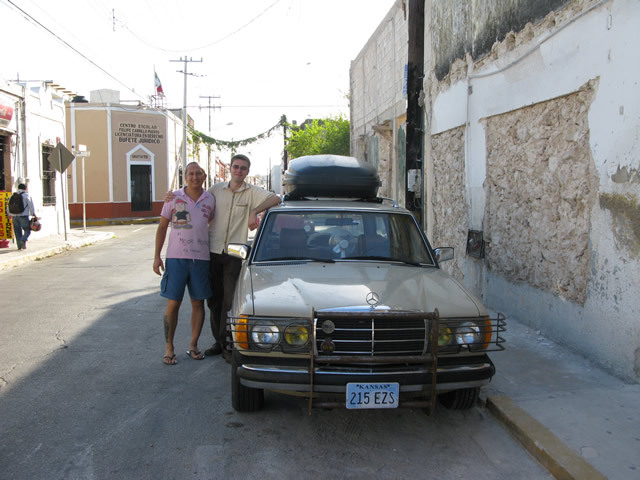 He had a friend in Merida, and was utterly ecstatic about the thought of diving in the crystalline coasts of Quintana Roo. 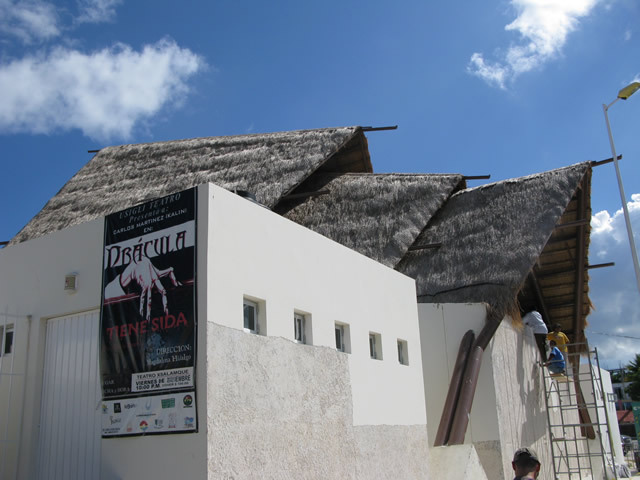 Delightful hostel in the eco-touristic area of Palenque, Chiapas. “Speak Spanish? License and documents, sir”, he asked. He checked all my paperwork and pointed an accusing finger at RG in the back. “Do you have a seatbelt?”. I looked back and realized that my “modification” of the cargo area had left the seatbelt straps dangling from the pillars of the car. What followed became a game of patience. “She is not wearing her seatbelt. According to the book, it’s a $1500 peso fine”. Thinking of the many people I had seen crammed in the back of pickup trucks, I retorted, much to his surprise: “Interesting. The military did not say anything two hundred kilometers ago”. “The military is the military, we are the police”, he replied firmly. “That’s alright with me. Show me the way to the police station and I will gladly pay it in cash”. The officer’s eyebrows raised as he managed to put his words together: “The police station… it’s closed. They close at 1pm”. He really made the situation seem like the fine could only be paid then, and there. This really had potential to ruin our day. Still playing my cool cowboy learnings, I offered to wait until the next day. Unfortunately, Manuel, feeling guilty for being our third passenger, offered to pay for displacing RG to the back. “There has to be an alternative way!”, he said nervously. 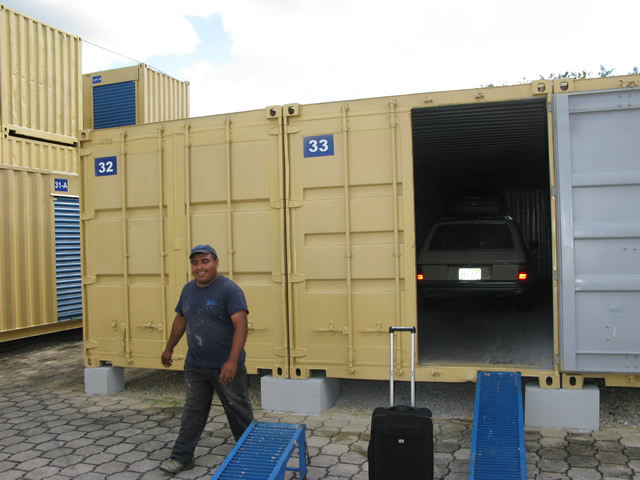 And yes, $600 pesos later, we were let go... Manuel had saved us from quite a tedious battle. A few miles later, we pulled into a nearby gas station and unsheathed my knife. I opened the rear doors with a hint of fury and cut off the dang seatbelts out. 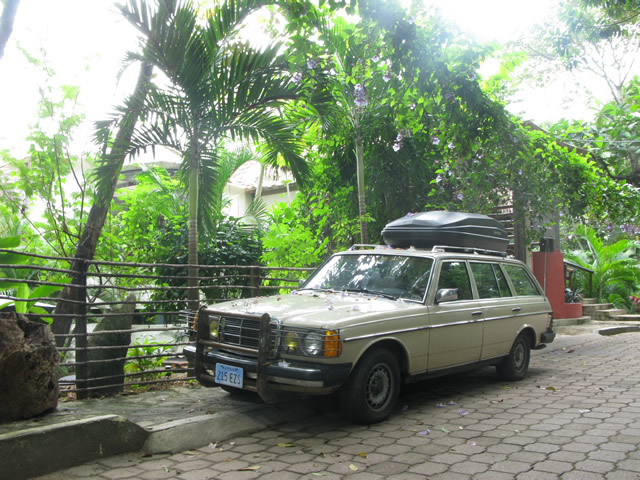 “As far as I am concerned, this car is more than thirty years old and was never, never equipped with rear seatbelts. I am a mechanic, you know? I know these cars well!”, I said with a crooked smile and a wink. First time Livingstone sees the ocean. Right next to it, the best seafood soup I've had in a while! The 30-year-old car trick worked well, yet the officers in the following stops still tried to look for even more potential reasons to get bribed. “Your license is expired, sir!”. By now, this had become a joke. “You don’t say, officer! You must have gotten the numbers wrong! Just look in the little column in the back of the license and check for the little letters. Field 4a is the expiration date, valid until 2017”. The policeman pressed his lips and pointed at my documents. “This registration… it looks like it is valid until 2010!”. I resisted laughter and pretended to be surprised: “Wow, that is quite news to me! It was given to me on August 20th this year, and if I am not mistaken, it’s decorated with the numbers 1910 and 2010 as the centennial of the Mexican revolution!”. He gave up on his tricks and we moved on to talking about the gas mileage of the car. Boy, how many miles of this will we have to endure? We arrived to Merida after sunset. Merida is quite a creepy, dilapidated town at night; there wasn’t a single soul in the street, and many of the beautiful historicist buildings showed obvious signs of neglect. 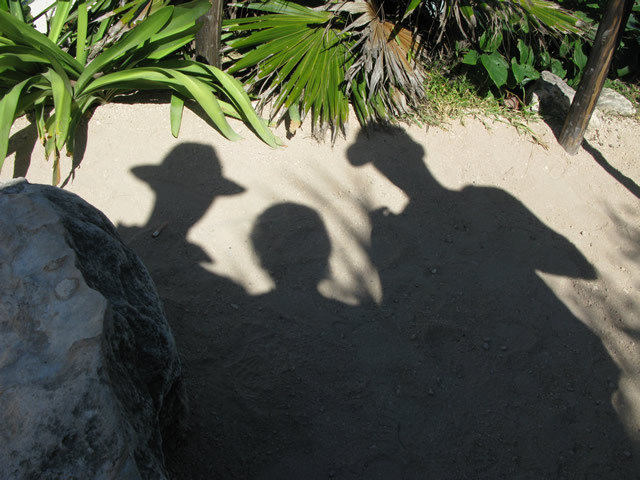 The three of us had a few local specialties for dinner, seasoned by tunes of a nearby Spanish –yes, from Spain– music festival, and then split to our respective accommodations to meet back the following day. I stayed for the next two days with Rafa, a hostel owner who destined a comfortable sofa for the couchsurfing crowd. His little piece of paradise is a tiny building decorated in the most eclectic, cosmopolitan mix of world flavors his visitors could bring. I myself gave him an old US license plate for his collection, the one I had registered my previous wagon with. If you stop by the Hostel "La Casa del Tío Rafa", look for the California plate… that’s mine! Look at these crazy three! 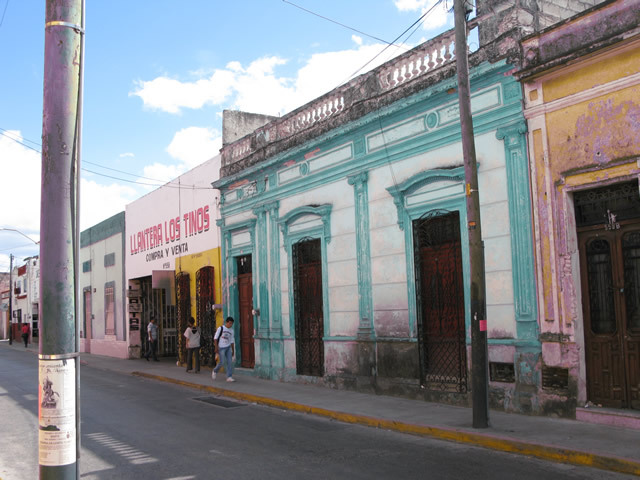 From what I could gather in the space of a day, Mérida is closer to the style of the Caribbean than the rest of Mexico. 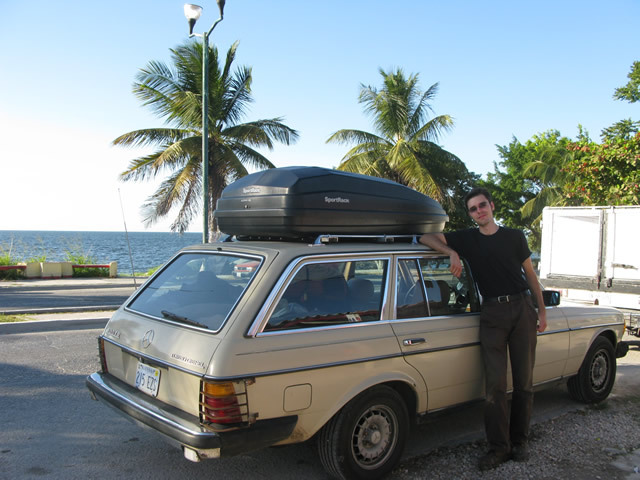 The architecture, music, food, way of dressing and overall attitude towards life is far closer to that of Cuba than those of the mainland. Still, it seems that Merida had seen better days: you will see many buildings empty, or faded by the years. Downtown is a maelstrom of moving bodies and turn-of-the-century architecture, seasoned by automotive fumes in a very 1930’s fashion. Still, many a indigenous girl can be seen selling souvenirs amongst these promises of modernity. Shabby buildings, bright colors: smells like Caribbean here! A lil' rationalism, a lil' colonialism... add a dash of CO2 and you're set! Manuel the Spaniard made a little mistake with his buzzer, so he resorted to some enthusiastic professional. 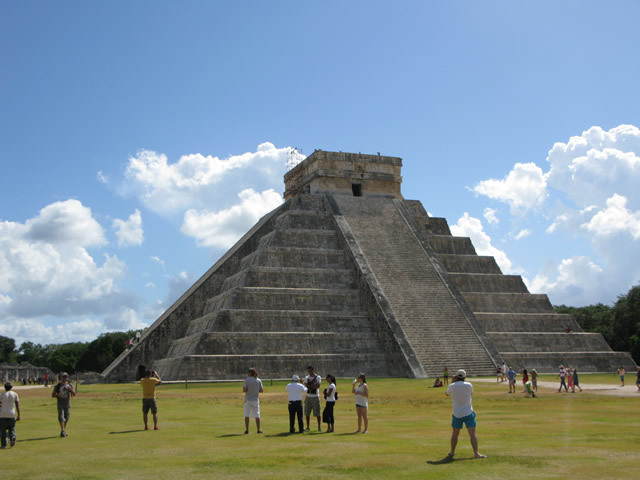 On our way to Cancun and Playa del Carmen we could not miss out on the Mayan ruins of Chichen-Itza, an impressive complex if you can get past the hoards of shrimp red, sandaled tourists. Pictures speak louder than words and this article is getting kind of long, so I will let the photographs do the talking. 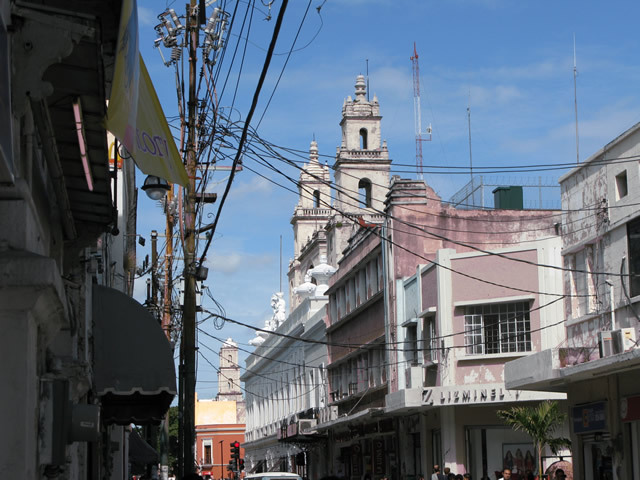 Right on the way is the town of Valladolid, with ample colonial avenues and a beautiful food court downtown where locals, as well as some sparse foreigners, can enjoy all kinds of grilled meats and flavored waters for very little money. 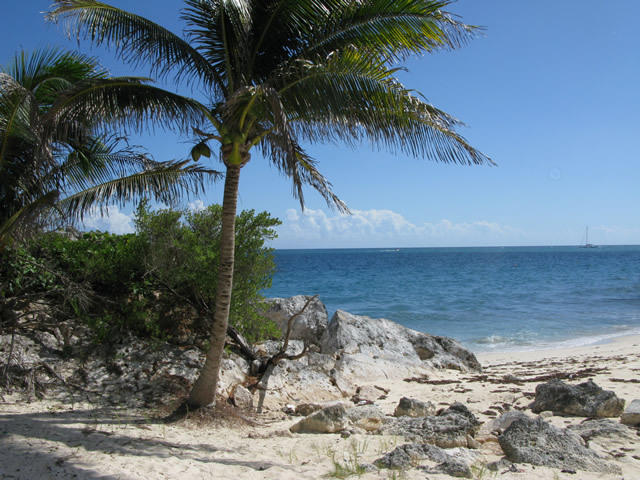 The next day we visited the scenic ruins of Tulum, right by the ocean, and waved RG goodbye on her way back to the US. The following day I would do the same, but with a very different destination and purpose: to find a lost treasure in Cuba. 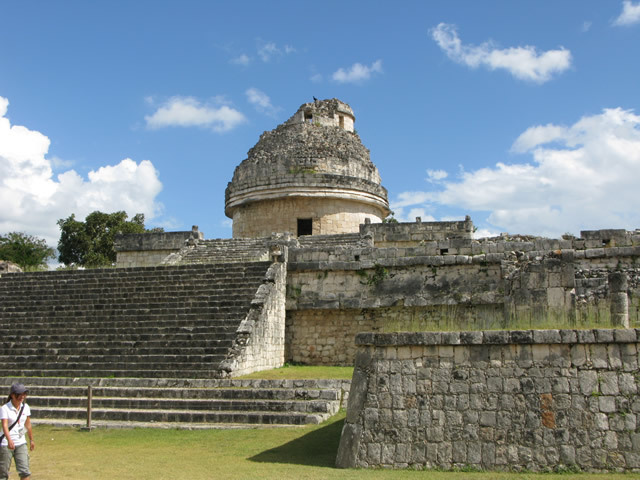 The majestic ruins of Chichen-Itza. Currently, the top of the main pyramid is not open to the public. 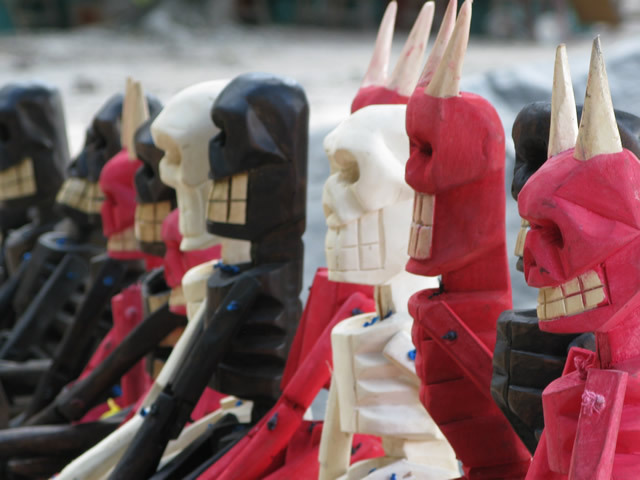 Wooden souvenirs –a reminiscence from the Day of the Dead. Leftovers, perhaps? The observatory at the complex. I was tempted to film a "Sound of Music" parody right there on the grass. 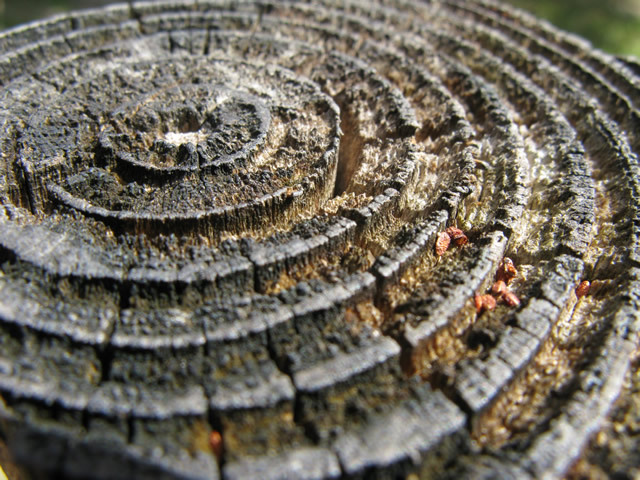 After much fiddling with my camera, I shot this close-up shot of a fence post. 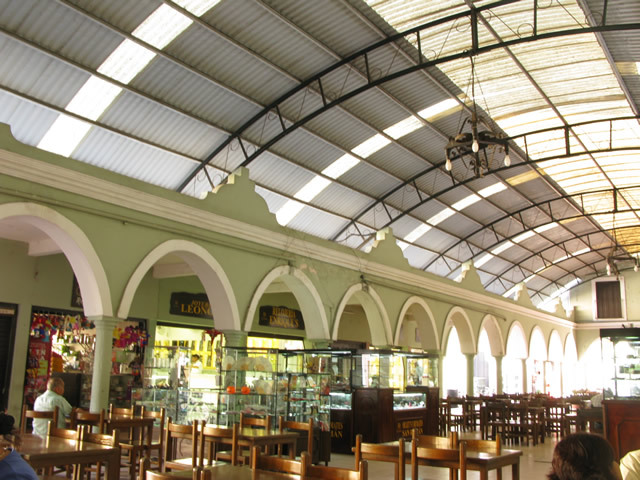 Valladolid food court, with an assortment of flavored waters and juices beyond your wildest dreams! Paradise of what? 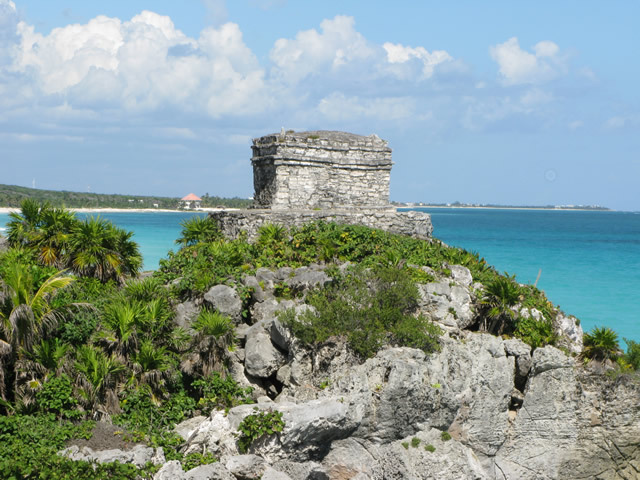 Right in the heart of the Tulum ruins. Aaargh! The Spanish are coming! The Spanish are coming! Three good friends, united by an automobile and the quest for sights! Finally in Cancún... notice the "Dracula has AIDS" poster to the left. ...and in it goes. See you in two weeks!